In my recent review of the AbdesSalaam Attars Profumo perfume Tcharas, from the Italian fragrance house La Via del Profumo, I extolled the quality of raw intensity that I experienced in that wonderful scent. I am happy to tell you more about this line, starting with a few that are very different in character from Tcharas. This all-natural line contains a dazzling array of perfumes in a wide range of styles. The samples I have tried are only a small part of the sumptuous menu of offerings from the very talented perfumer Dominique Dubrana, and after testing them I only want more. The lightest in the sample group is Acqua Santa, which is a unisex cologne, and it may just be the Platonic ideal of a cologne, what the original 4711 must have been like in its prime before it was ruined in modern times and sold by the liter in mass market drugstores. It has some of the woody austerity of Guerlain's Eau de Cologne Imperiale, but it is not citric or sharp. The unique aspect of it is the use of sandalwood and frankincense, instead of the usual woods such as cedar or pine normally found in traditional colognes. There certainly is citrus here, but it's a lovely soft orange blossom instead of a squeaky lemon or lime oil, and a just a hint of rose softens the whole thing. The herbal elements are subdued and interesting; I can't say exactly what they are, since they do not jump out as much at the opening the way they do in most compositions of this style, but I think I smelled santolina and absinthe, a.k.a. wormwood. The name means Holy Water of course, and it meant to be a scent to “open the heart” and calm the soul. It is gently cooling and I look forward to wearing it when summer comes. Of course it is fleeting like all of its kind and reapplication throughout the day would be fine, but it lasts better than one might expect for such a sheer fragrance, and the incense lingers on the skin for several hours. Grezzo (d' Eleganza) is nearly as light as Acqua Santa, very dry, and as dapper and refined a masculine fragrance as you are ever likely to encounter. A similar structure of herbal notes, rose and frankincense is discernible, but there is a little something extra in Grezzo; castoreum and vanilla; the castoreum gives it some depth and nudges it over into the masculine realm. I suppose a woman could wear it since it's not of a clichéd “manly” style, but it is one of those wonderful scents that really smell best on a man, while you (if you are female) wear something softly feminine to play up the vive la difference contrast. The perfumer says that he wears Grezzo, which was originally made for an (unnamed) Italian fashion designer, when he “must attend the world of fashion or high society.” It's certainly perfect for those whose lifestyle permits, but for any man it would be ideal for a special date or gala event, although we would rather smell it on you more frequently than that, so please, splash with abandon. The women of the world will thank you, and possibly follow you down the street. There is a great Italian tradition of quality fragrances for men, and it's wonderful to find one of them in a 100% natural formula. The last of this group was made for women, and I wish that my sample of African Night were a really big bottle instead. I have never been to Africa and I probably never will, so I don't know if it smells like its name, but I know what it smells like to me; the sweet living breath of the earth and awakening life. I once went for a ride in a hot air balloon, an undertaking which must be accomplished very early in the day while the air is cool so that the balloon will rise. It was in summertime shortly after sunrise as we drifted soundlessly through the lush green pastures and forests of rural Oregon, and as we passed over fields where thousands of berry bushes grew, their delicious aromas rose up in tantalizing waves to delight us. It was a mixture of rich, damp soil, fresh growing leaves, sweetly fragrant blossoms and the ripening fruit of cane berries, bursting with juices in the warming sun. This was many years ago, but when I smelled African Night it immediately reminded me of that day. Its balance is a bit more flowery than fruity, since the fruitiness is partially the result of a particularly excellent extract of ylang ylang, combined with rosewood, hibiscus and grapefruit. How this brought me back to the berry fields I have no idea but I heartily approve of the effect. 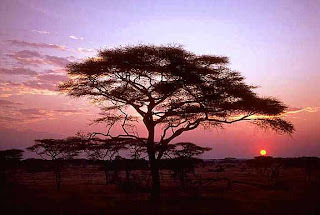 African Night is said to be an anti-stress perfume, and it does seem to be conducive to a serene state of mind. It has a youthful, vibrant personality and a light femininity that would make it wearable for almost any woman and it is simply superb for summer wear. I know I will be longing for more of it once the really hot weather arrives. Next time I will explore a few more perfumes in the Arabian-inspired styles for which this house is best known, including the new Mecca Balsam. Image credit: The African savannah at night, from profumo.it. You make all three of these sound delicious. Time to order samples, perhaps? Coincidentally I'm wearing Grezzo d'Eleganza as I write. I've been in love with it, along with several other Durbano scents I got in the mail. I wouldn't describe Grezzo as overly dry. I like very dry scents. It's got a bit of warmth/richness/sweetness to me. But it is definitely a masculine scent. Very, very wearable. The sample program they have via their website is excellent. I wish more boutique houses handled this so well. The samples are attractively priced and come in small labelled bottles with enough juice for several applications. I got some for my wife and for myself. They arrived in less than two weeks from Italy. No reason to work with decants in this case. You can get samples straight from the source. I have not really explored this line, but everything I've read has been fairly complimentary. The only scent I have any familiarity with is Night Blossom, which I tested in my All Things Tuberose phase this past winter. It's described as being the scent of tuberose in a night forest - and while there's some good quality tuberose in there, there's also a huuuuuuuuuuge note of really green-herbal patchouli. While I can take green-herbal patchouli (which I think is actually the primo aged stuff) better than the dusty-earthy variety, it's still something I seem to be hyperosmic to, and just a little bit can overwhelm me. Night Blossom about knocked me flat: PATCHOULIPATCHOULItuberosePATCHOULI. Gretchen, from what I can tell, it's less expensive to order samples if you live in the U.S., or anywhere except an EU nation- no VAT (Value Added Tax)! Mark, it's definitely not as dry as many men's fragrances, but I did not get a whole lot of the vanilla, mostly the other notes and the castoreum of course. It's been cold and rainy here for weeks - I will have to wear it on a warmer day and see what happens! I totally agree about the samples - lovely presentations and such a generous amount! That alone would convince me to buy the perfumes over another house's that did not offer samples. The little bottles are so pretty that I am going to save them to use for decants from my bigger bottles, and hopefully for decanting from a full size bottle of a La Via Del Profumo fragrance someday soon! C, I have a sample of the Night Blossom as well, and it will be reviewed in part 2. I get all that PATCHOULI too! It is the good stuff, but it certainly has a presence. Hey, my WV is a real word - "common". Nothing common about these perfumes! African Night sounds lovely for this time of year. Thanks for the awakening! I ordered the "Kit del Profumiere" of 5 mini bottles back in February, after all the buzz on the blogs about Mecca Balsam. Arrived pretty quickly (I'm in the US), and I thought the pricing was very reasonable. I am still enjoying sniffing the woody/spicy fragrances I chose to try.